As a human resources manager or business owner who is charged with finding and selecting the best candidates for your workplace, a background screening company is one of the many partners you’ll rely on to get the job done right. A good screening company will deliver quick, accurate, comprehensive reports using sound practices to mitigate your risks and enable you to hire the right people, the first time. Successful background screening companies understand how to balance human capital risk with the risk tolerance of the client’s organization, the compliance environment in which the organization operates, and the overall strategic goals of the organization. With this unique understanding such companies will help you build an effective screening program that satisfies your key business objectives and enable you to build a better workforce. Selecting a background screening company typically involves a process of asking for referrals or conducting an online search, reviewing the websites of several companies, narrowing down the selections to a few that appear well-suited, then requesting quotes from those top choices. Your quote request might be as simple as, help me build and implement an effective screening program for a 500-employee firm. Or it may be as specific as, provide a budget for 500 background checks per year consisting of nationwide database search, local criminal records, ssn validation, driver’s records, drug screening, and employment verifications. Regardless your needs, there are several important factors to consider in the process of choosing a background screening provider. On the surface, proposals you receive from background screening providers may look quite similar. So much so that it may be difficult to see and understand the nuances that make one company stand out from another. Price, however, is something nearly everyone can understand. We see a price and we can immediately compare one provider to another on this one tangible difference, right? Unfortunately, wrong in many instances. In an effort to represent the lowest possible price many organizations have stripped out all but the base price for services and attach to that a byzantine maze of schedules of additional fees. Often what is quoted and the true cost of screening are two very disparate states. Make sure you understand what fees if any apply to you and ask that your provider estimate by percentage what the cost impact to you will be..
Another challenge in employment background screening lies in the old adage that cheaper not always better. Less expensive usually means less comprehensive, or that quality is sacrificed somewhere in the process. Quality background screening is not cheap, but it is very affordable and when you consider the price too many employers have paid as a result of letting price rule the decision process, you’ll quickly see why doing it right is better than trying to do it cheap. Remember this when comparing price from one company to another: Be sure to compare apples to apples and remember, the cost of screening is a fraction of the cost involved in terminating an employee, the cost of recruiting, hiring, and training a replacement, and the cost to settle a negligent hiring lawsuit. Don’t be seduced by companies that promise to find anything about anyone, with no questions asked. These are generally data miners who are not certified and sell generic information, or more likely, inaccurate, out of date, inappropriate misinformation. When employers choose to work with such companies they unfortunately put themselves, their organizations, and their employees at great risk. Equally seductive is the promise that this will always get done in under 24 hours or some other arbitrary timeline. No reputable screening firm will make this guarantee. The fact is that many of the over 3000 courts control access to the public record and dictate how and when these record are disseminated to the public. Screening firms are NOT in control of this process to the degree they might imply. When selecting a background screening company, steer clear of those who offer a “one-size-fits-all” approach. Companies with this rigid approach will offer you a pre-designed program that fails to consider your unique risks, compliance issues, and business needs. While sometimes you can get away with a packaged approach, most often employers end up paying for information they don’t need, or worse, miss out on essential information that is needed. A screening company should listen to your needs and tailor a screening program appropriately. If the company you choose to work with neglects to ask insightful questions about your company, the positions you’re hiring for, your organizational risk appetite, your business objectives, and other questions that affect the composition of your screening program, buyer beware. 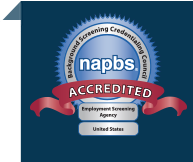 Before you hire an employment screening provider, contact the National Association of Professional Screeners (NAPBS) to ensure the company you’re considering ia a member in good standing . While not a guarantee, membership in NAPBS gives you a good indication that the company is staying current with best practices and changing legislation. You can find a NAPBS member company here. A problem in the background screening industry that is currently being addressed through legislation and other measures is the off-shoring of sensitive personal information (i.e. social security numbers and financial account information). This information is sent offshore by certain background screening companies for processing of certain background checks. As a member of Concerned CRAs, we believe this practice places both applicants and employers at risk and should be avoided whenever possible. And if it must happen, applicants and employers should be made aware of this practice. The problem is, while we have protections in the U.S. for identity theft and other issues surrounding access to personal information, those protections do not exist once personal data leaves U.S. shores. Clearly, no employer wants to be faced with the liabilities that can ensue when applicant data is mishandled. Criminal records searchers are often the cornerstone of many employment background checks. To save money, employers may be tempted to rely upon a national record search as the end all be all source of criminal information. A responsible background screening company will refuse to allow an employer to cede to this temptation. Irresponsible screening companies that allow clients to use national database records searches as the authoritative record put their clients in great danger since the quality of databases vary from source to source and simply cannot be relied upon without further verifying database information with a local court-level search. National records should be positioned as an important pointer to guide criminal records searches at a local level. Read more about national criminal databases here. 7. Look for relevant experience. Does the screening company you’re considering have knowledge of your organization, industry and relevant compliance issues? Your employment screening company can be a powerful source of advice, information, and experience – if you choose a knowledgeable partner. A reputable background screening company will steer an employer through the screening process – not only the legal concerns of the process, but also the administrative aspects, from obtaining initial permission from an individual, to offering courses of action based on results, especially when adverse action or reinvestigation may be required. If you lack the expertise of an experienced screening professional, chances are you’ll need some advice along the way. Find out if your screening company offers access to the people, higher up in the company, that truly know the world of employment screening. In other words, find out if you’ll be stuck with an inexperienced call center employee or if you’ll be given the direct phone number of top-level managers. A reputable background screening firm will want to understand your sourcing, recruiting and on-boarding processes. They will work with you to engineer a repeatable and predictable process that meets the needs of all the HR stakeholders and aligns with your strategy and culture. Your provider can be the best in the world but if the process is flawed you wont like the results. Which Background Screening Company Will You Choose? Certainly there is more to choosing a background screening provider than the tips we’ve listed above, but we hope this advice will get you closer to finding the right partner. At Proforma Screening we pride ourselves in offering a consultative approach to employment screening services that considers the unique goals and risks of your business. Request a meeting today and learn how our screening services can help you build a better workforce.